Asian stocks joined a global markets selloff after the European Central Bank shocked investors by failing to deliver the dramatic stimulus moves they expected. Japan's Nikkei lost more than 2%, while China's Shanghai Composite fell 1.7%. The ASX All Ordinaries closed down 1.4%, and all other Asian markets finished Friday in the red. 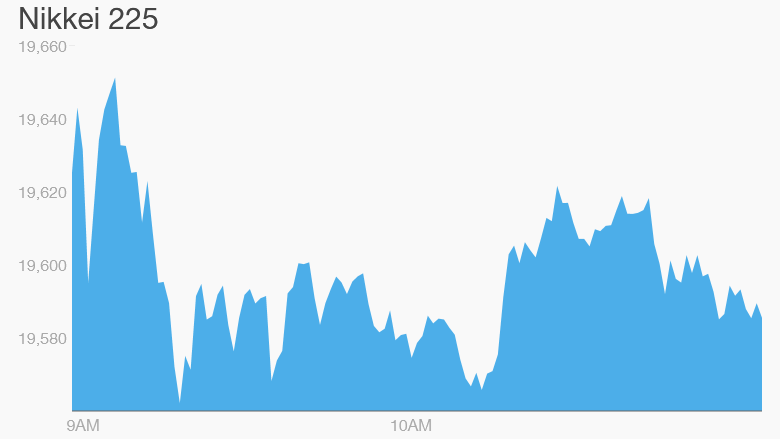 The dismal day in Asia followed a rough Thursday for investors around the world. Germany's DAX and France's CAC 40 fell 3.6%. Markets in Spain lost 2.4%. In the U.S., the Dow dropped 252 points, and the S&P 500 fell 1.4%, its worst day since late September, while the Nasdaq lost 1.7%. On Thursday, the ECB cut interest rates to try to boost Europe's economy, but failed to take stronger stimulus measures, disappointing investors. The ECB cut its deposit rate deeper into negative territory -- effectively charging banks more for holding money with it -- and said it would continue to buy government bonds and other assets until March 2017, six months longer than previously planned. But it said those purchases would continue at a rate of 60 billion euros ($65 billion). Investors were surprised, as they had been expecting the ECB to announce an increase of at least 10 billion euros a month. There's still plenty ahead to keep investors on their toes. On Friday, the main event will likely be the jobs report, which is one of the final big pieces of economic news the Federal Reserve will get before making what could be a historic decision on interest rates. The Fed has signaled it is likely to raise interest rates later this month for the first time in nearly a decade. Markets are also keeping a close eye on Vienna. That's where OPEC members are meeting on whether to cut output amid the crash in oil prices. But the oil cartel, led by Saudi Arabia, is widely expected to keep production steady in an effort to crowd out higher-cost producers.